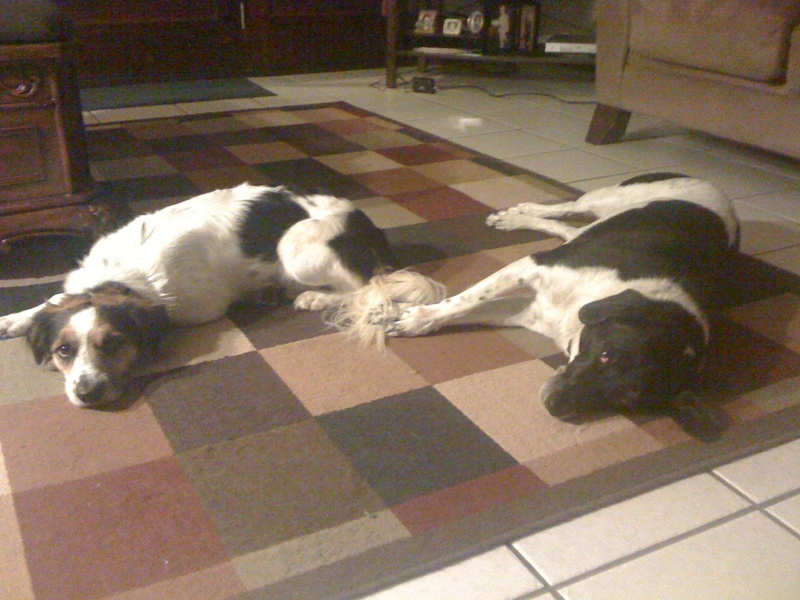 Dog "daze" are hard to decipher. Why do their faces mirror depression when they don't have a care in the world? The only thing for sure is that they're spoiled rotten. 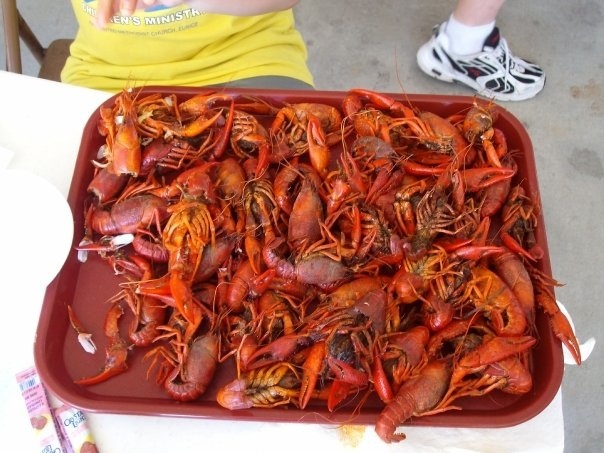 As a Louisiana Protestant in a region where Protestants are minority, one of the blessings of the Catholic season of Lent is the emphasis on seafood. What kind of penance is this, anyway, to have to eat boiled crawfish in lieu of filet mignon? Or shrimp in lieu of pork loin? Or oysters in lieu of ground round? Eating boiled crawfish is hardly a punishment. 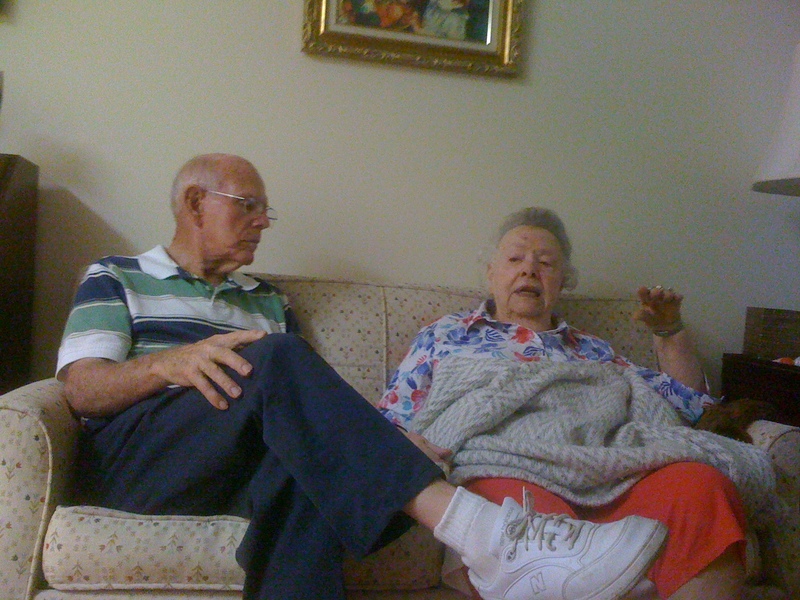 One of Daddy’s last visits with Aunt Pearl, just a couple of years ago. They’re both gone. Daddy’s older sister Aunt Pearl left us this morning. That’s happy news in the sense that her earthly tent was worn out from well over 90 years of habitation; thus, her passing released her from the ordeal of advancing years and failing health, much like Daddy’s passing was solace last year. But at the same time we mourn, perhaps more for ourselves than her, because she was the last of Daddy’s generation. Papaw, Mamaw, Uncle Bud, Uncle Tom, Uncle Jack, Daddy all went before her. She stood as the last survivor of the decent working class folk from whom we’re decended, people who understood the value of hard work, the care of family, the right cause of neighborly conduct, and the need to fear God along the way. That’s a legacy which my brothers and sisters and all of our children hold with pride and gratitude. Considering her as a cast member in the parental clan, I could characterize Aunt Pearl as unique, as a remarkable character, as a colorful personality, as outspoken in many opinions; all of those are accurate descriptors, but they’re really insufficient to accurately depict this family icon who looms so much larger than life in our memory. She truly was an icon, partly because of her longevity, but more because of her unforgettable, inimitable, incomparable character. She was a fount of family lore to both my generation and to my kids. We listened with rapt attention to stories and tales from hers and Daddy’s childhood down in the Parish where her family grew up. Her memoirs were ever saturated with homespun history and humor, flowing in almost musical eloquence and delivered in the most charming St. Bernard accent ever heard along the banks of Bayou Terre aux Boeufs. So, her memory does remind us that we are family, the common descendants of Walter Lee and Aurelia Belmonte Pulling, good people of the earth, and as such, a blessed family and people. And, we’re happier yet that we look forward to a reunion with Aunt Pearl in the glorious installment of eternity that follows the present. As often as she blessed us with gregarious laughter in a thousand or more grand family times, may God bless her precious memory. A Facebook friend of mine recently posted a comment declaring the existence of a national condition known as “electile dysfunction”: a condition resulting from the slate of candidates’ incapability of arousing any interest or passion among the electorate. This blog earnestly avoids polarizing political commentary, but when I look at (and listen to) some of the candidates, I can’t resist a cynical jab in the interest of good satire: today’s victim, Mitt Romney. 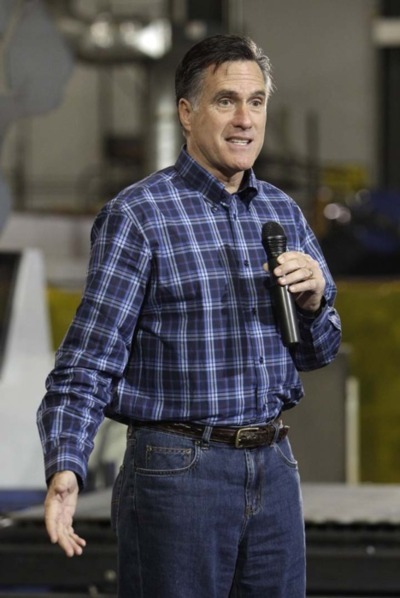 Romney, though, seems to be “starched”: Starched/pressed blue jeans, starched/pressed shirts, and even starch/pressed hair. Gollee, the man looks ridiculous! Does he really believe he compells middle-class descendants of the blue collar working class, like me, by donning starched/pressed blue jeans and wearing an open collar? Nope. He’s utterly unconvincing. To me, his glossy phoniness crystallizes an impression that he’s nothing but a dirty-rich upper class snob attempting lamely to impersonate middle-Americans to win the election. 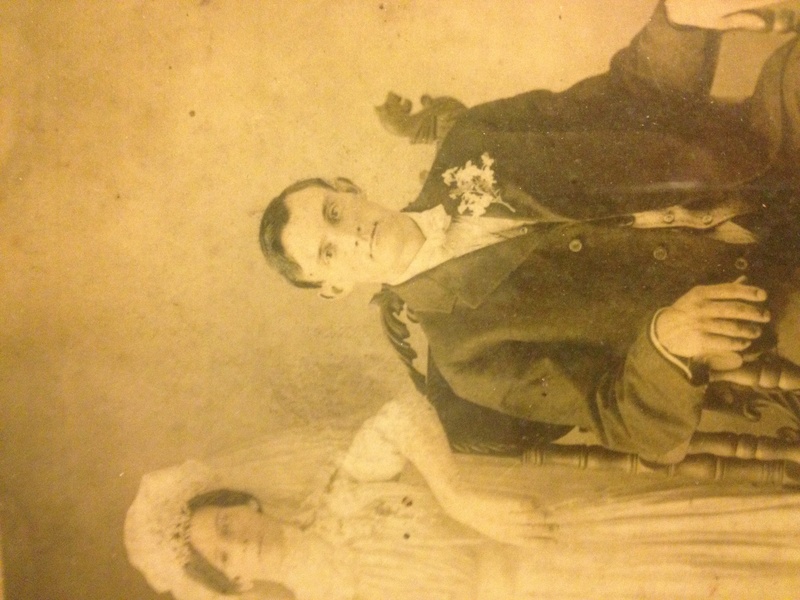 My grandfather was raised on a farm in Illinois until he came down the Mississippi River around 1910 and met a Spanish girl at Delacroix Island in St . Bernard Parish, Louisiana. That romance accounts for my family’s situation in this part of the Gulf Coast, and also accounts for the tradition of family and heritage that I value to this day. I recall the pathos in his speech as he went on to explain how his father abandoned his mother and his brother and sister. He didn’t have much regard for that absentee father: Notably, he didn’t refer to the man as “Daddy,” and he had no kind regards or memories of a biological father who reportedly loved drink and gambling–the party life– more than he loved his wife and children. My PaPaw could have followed the role model his absentee father provided for him, but gratefully he rose above those circumstances and became a man of character. He helped my MaMaw rear a family of seven, supporting her as a faithful provider and helper throughout the economic trials of the Great Depression. My Daddy revered Papaw. In fact, he found his role model for “Daddy” in that special grandfather who overcame such adversity from his own childhood. I’m grateful for such a legacy of manhood. May this example before my own children be worthy of such a noble tradition.